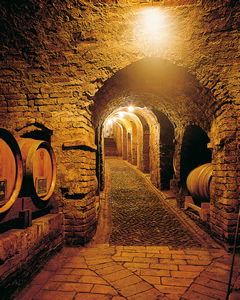 The winery dates back to 1582. The house is at the end of the village, in the high part, a grape-pergola and a Chinese wisteria at the corner of the fence. The winery dates back to 1582, it is fresh and deep. It is built with engineering bricks, vaulted ceilings and stone floor; it extends under the house and the garden. The village is Neive, circularly structured, with a tower and two castles-palaces on the sides..
Curra’s vineyards with South-West exposure, white and dried land. Marcorino with South-East/South-West exposure, on the peak of an airy hill, white and potassium-rich land. The weather has maritime and continental elements, the grapevine naturally thrives there. It is possible and appreciated to visit the winery. It is better to inform before. It's possible and it's a pleasure for us to visit the wine cellar. You should inform us before you come.